In the modern world, watching TV shows isn't what it used to be. Back in the old days (or the present for some), shows simply existed at a certain time and you tuned in when they aired, and then they were cancelled and then you never heard from them again. Today, though, it's not uncommon for most viewers to discover a show a few seasons in and then find their way through the backlog of episodes. 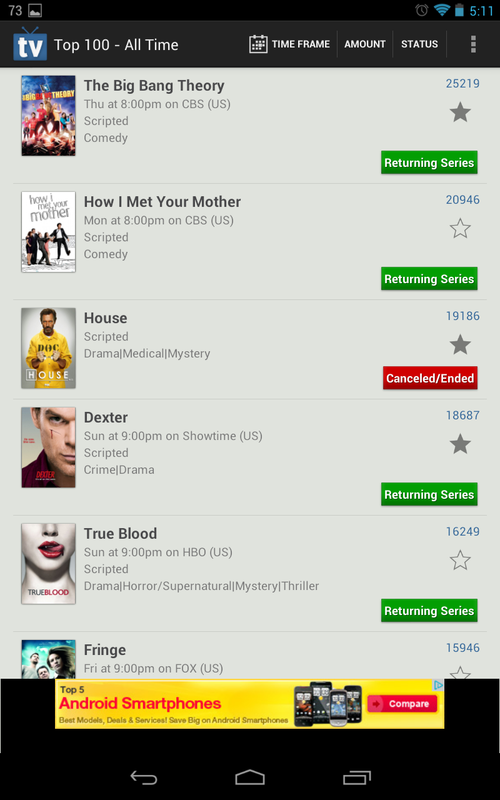 It can get overwhelming when you need to sort through which shows are still on, which shows you've seen, and how many more episodes you have to go. We need a new kind of TV Guide. That's where TV Show Favs comes in. Update: As of last night, TV Show Favs was experiencing a server outage due to a "performance issue which absolutely had to be fixed for the server to be stable." While the developer fixes this, they've pulled the app from the Play Store and current users will be unable to log in. We were told that everything should be up and running "by the morning" (September 12th). The service is still down as of right now, 11:45 am EST. We'll update when the app is back and the server is running again. Update 2: The dev has let us know that the server should be back up and running so current users should be able to log in again. If you're looking to download it from the Play Store for the first time, the app has been republished, but it make take a little while for it to appear again. Just keep hitting refresh. 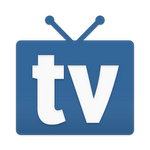 TV Show Favs is an extremely customizable and detailed database of television shows with all the information you need to keep current and, most importantly, the ability to schedule what shows you need to watch at what time. 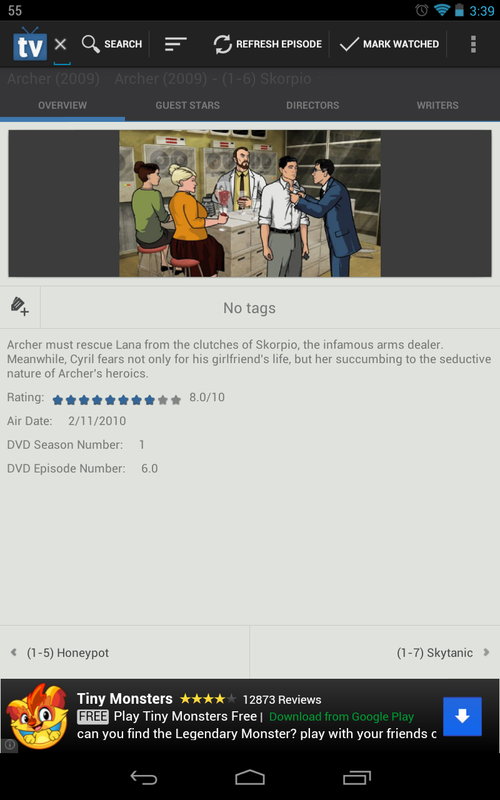 Not to sound like an overly enthusiastic fanboy, but this app is, in most measurable ways, perfect for keeping up with every show you love. The core of the experience, My Shows, is a place for you to collect all your favorite programs in one place. The database of titles is actually really impressive. I found entries for everything from Archer to Dexter, Beast Wars to the Newsroom. 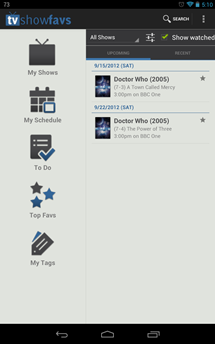 The information for each episode is in-depth, and the app integrates really well with IMDb. You won't be using that, though. You'll be spending all your time looking over the Top 10/50/100 lists for your favorite shows and marking off how many seasons of each you've seen. Just try not to reflect on how much of your life this amounts to. The nice thing about the My Shows section is that you get a clear, concise picture of just how much you have and haven't seen. Specials are included in each series' listing page. 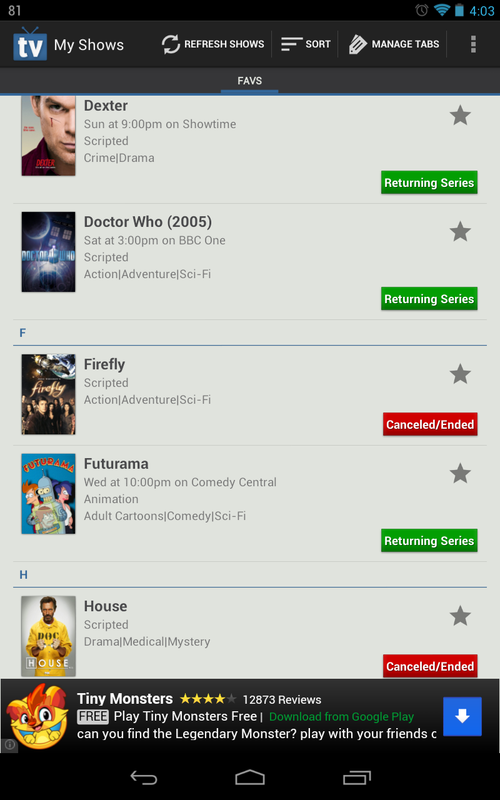 So, if you somehow missed the four Futurama movies in between seasons 5 and 6, you'll discover them here. Once you've entered in what you've seen—which you can do on a per show, per season, or per episode basis—the real fun begins. 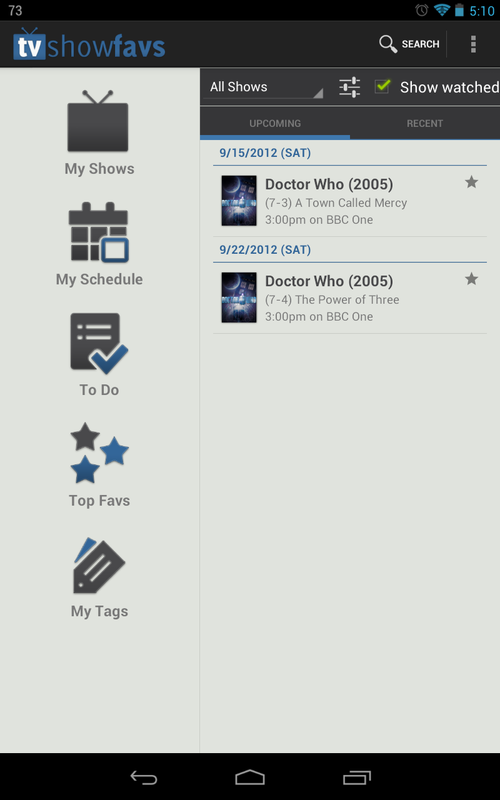 Having an app that keeps track of what shows you've seen is nice. It's not very useful, though. You already know what you've seen! Sure, you can't always remember which episode is which, but what good is a database? Well, in this case, the app now knows what's next for you. I'm up to date on Dexter, of course. There won't be any new episodes for a few weeks, but when there is, I can find exactly what date, time, and channel it will be on. As someone who doesn't have cable, this information is only marginally useful, but it does provide some sense of schedule. Without the all-powerful cable box to center around, TV watching needs a reference point. TV Show Favs provides it. 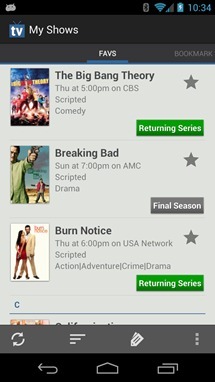 Left: List view shows the next episodes to air. Right: You get NOTHING! You LOSE! Good DAY, sir! The calendar view is largely useless, though. 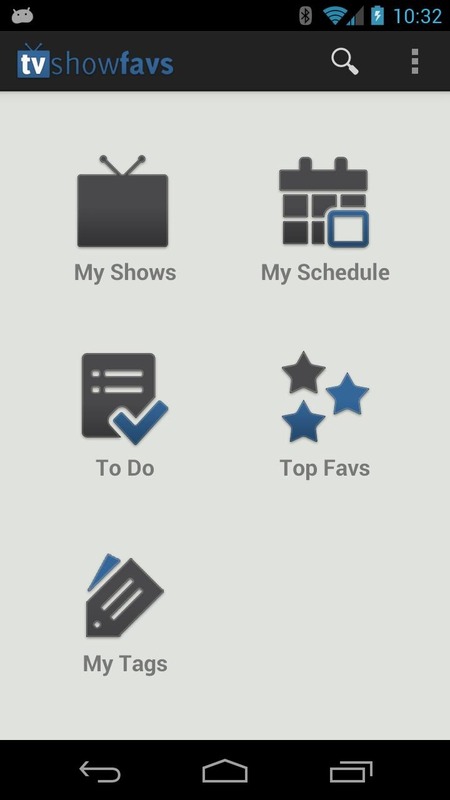 Do yourself a favor and immediately press the menu button under "My Schedule" and select "Show Upcoming As List." And leave it. The only time this view would be useful is if you have a large number of shows you need to watch every day. 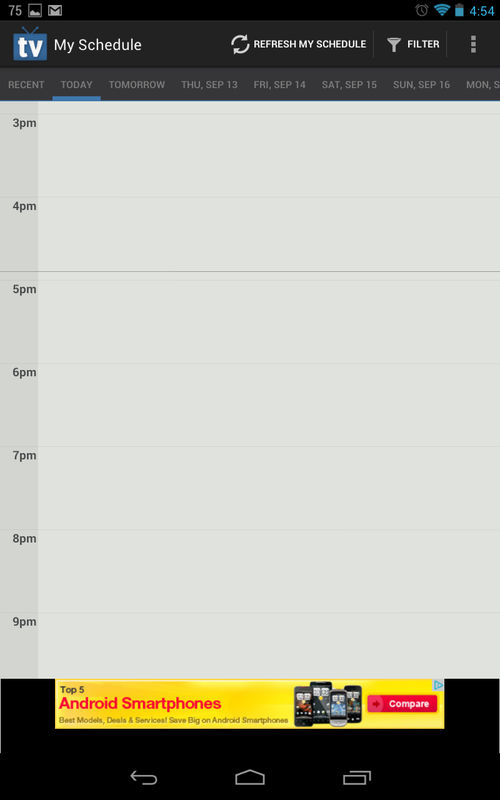 In a truly bizarre move, even in landscape mode on a 10" tablet, you can still only view one day at a time. There are a ton more features that TV Show Favs offers. The ability to tag shows to sort them by your own organizational scheme. 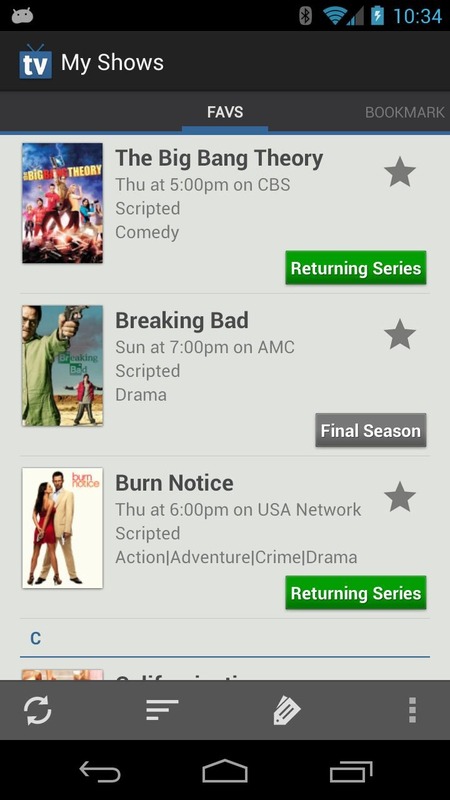 The ability to add specific upcoming episodes to your Google Calendar very easily (it's actually quite brilliant). A To-Do list that includes upcoming episodes, past episodes you haven't watched, and specials. You can customize on a per-show basis which features to include. Additionally, this app, while free, offers in-app purchases for certain extra features. The payment model is pretty novel, though. If you want to unlock all the extra bells and whistles, you can do so for $5. These features include removing ads, notifications, social network integration, dark and (another) light theme, and more. However, if $5 is too much for your taste, you can purchase individual features piecemeal for $0.99 each. Just want to remove ads and try out a dark theme? $2 for you. Want everything? $5. Don't need any extra features? The core experience—and a very robust one, mind you—is still free. This may not be for the casual user. If you only ever watch one or two television shows (or you... umm... go outside? ), then you might not need a companion app to help you. This is for those of us who still want a tool that fills the void left by TV Guide's obsolescence, but don't necessarily still adhere to the old model of gathering around the glowing tube during prime time. It's useful, customizable, and only requires as much effort as you want to exert.